The Grenadier originated in 17th century Europe as a specialized assault trooper used in siege operations. They were soldiers who lead storming operations and would throw cricket ball sized iron spheres packed with gunpowder and ignited with slow-burning wicks. The Grenadiers were usually tall and strong enough to throw the grenades a fair distance and disciplined enough to operate in the middle of the battle. The elite Grenadiers would wait for the best time to through the grenade so as to not allow the enemy to throw the grenade back. The Grenadiers began their life as the Grenadier Guards in 1656 in Bruges, Spanish Netherlands and were comprised of English Royalists that served as bodyguards for the exiled King Charles II. A second regiment was formed during Restoration in 1660 and by 1665 the two regements were combined, creating one Grenadier Guards regiment comprised of twenty four companies. One of the oldest, largest standing and most active Grenadiers regiment hails from the Indian Army. The British Grenadier Guards continue to be part of the now historical ceremonial duties during peace time, but the Grenadiers also form part of three battle ready British Army batallions. 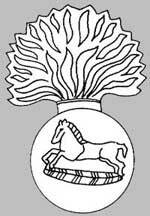 Across the Commonwealth, the Grenadiers share a common regimental insignia, a brass grenade bearing the White Horse of Hanover. They are a proud and distinguished clan, whose history and heroics should be shared with all. Copyright 2006-08, Grenadiers.info. Copyrights to images belong to original owners.